HandKrafted by Stephanie: Sharing Some Exciting News! Hello! Happy Friday to all of you! I have some exciting news to share today! As many of you know, I have been a Baker's Dozen design team member for a year and a half now, and I have been loving it! Being able to work with the Taylored Expressions stamps and dies has been a dream come true! I will be continuing as a designer and will also be taking on the role of Design Team Coordinator. Please join me in saying a fond farewell to our previous DTC, Jami, who has been with TE since the very beginning (5 years ago). We will miss her greatly, as she's been an integral part of the team and has managed to keep us so very well organized! I used Make it Amazing today, as this sentiment seemed to be appropriate. The sentiment, frame and butterfly are all from the one set. 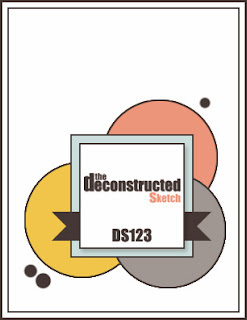 I used Jen's Deconstructed Sketch #123 for my layout. Thank you so much for stopping by! I'll be back on Monday when sneak peeks for our November release begin... hope to "see" you then! Accessories: Taylored Dies: Banner Stacklets 1, Elegant Butterflies, Totally Tags (TE); Foam tape, Thread, Sewing machine. Just like your creations, Stephanie, you'll do an amazing job! Congratulations! What a gorgeous card, Steph! I love what you did with the sketch! I'm so excited to have you taking on this bigger role and I'm looking forward to working together more! Congrats Stephanie! Surely you will run a tight ship :) Beautiful card! Love the pretty butterfly and your fancy stitching! 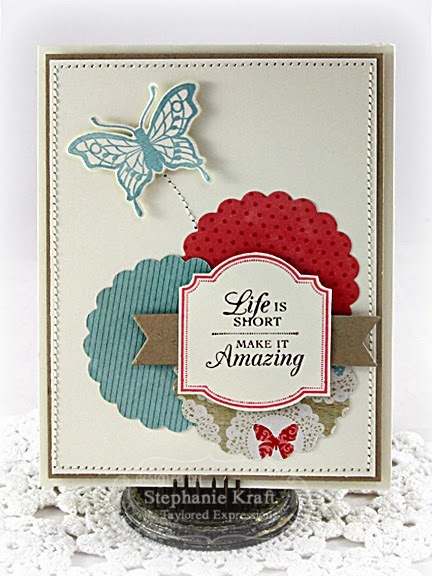 This is so pretty, I love the fabulous design and the great colors and sentiment. Congrat's on your new role! You'll do a great job, Stephanie!! Congrats :) Love the stitched butterfly trail!